Marxist Theory as a factor in the shaping of sociopolitical processes in Greece: Some Conclusions drawn from the action of the KKE. representative of the Ideological Committee of the CC of the KKE. The central work of Marxism, “Capital” is the foundation, the pedestal of a radically new worldview – Dialectical Materialism - that, having assimilated the totality of intellectual achievement, shattered the limitations of the interpretations of the world, creating the theoretical preconditions that make changing it not only timely but realistic. The general course of the development of the world after the emergence of Marxism, with ‘Capital” at its core and most importantly, after the conquest of power by the revolutionary proletariat, is known along general lines. 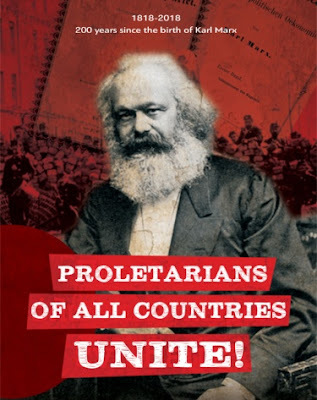 The subject has global dimensions, but we believe that it would be interesting to present a concise account of the specific conditions of the manifestation and development of the impact of Marxism on a specific country, so as to substantiate the conclusions of general importance. I will try to present an outline of the conditions for the realization of this process in Greece, those particularities that colored and marked the development of the sociopolitical processes from the point of view of the interests of the working class. Finally, I will refer to certain common laws, the existence of which we believe are confirmed in the example of Greece. In November of this year we will celebrate the 100th anniversary of the KKE. Our party was founded following the merger of socialist associations that were already operating in Greece, under the decisive influence of the October Revolution. Sporadic manifestations of socialist propaganda and class clashes had already occurred among the working class and the poor peasantry from the final quarter of the 19th century. As a result of a series of causes that we will not present here, Greece at the time of the founding of the Communist Party was a country marked by agreat extent of agricultural production, with still weak industrial growth and the strong survival of previous socioeconomic formations. Greek capitalism created a fairly sufficient extent of a national market only after the Balkan Wars of 1912-1913 while the country acquired its modern borders only in 1948. Throughout this period the development of a productive industrial base progressed, of course not without problems, with the strong position of the shipping industry being its particular characteristic. Greece was a kingdom until 1974 and had a language issue up until the 1980s. There continues to be no separation between church and state even today. The military defeat of the adventurist bourgeoisie in Asia Minor in 1922 and the arrival of more than 1 million refugees, shaped developments to a significant extent during the first two decades of Party action. The communists of Greece took a very clear position against imperialist war and the Entente, elaborating their positions relative to the issue of land, the separation of church and state, the rights of women and children, on the language issue. And, all of this in light of their clear position on the revolutionary resolution of the fundamental contradiction of every capitalist society – that between labor and capital. Under conditions of two dictatorships (1936 – 1940 and 1967 – 1974), foreign occupation (1941 – 1944) and civil war (1946 – 1949), the party was forced to act illegally or under conditions of semi-illegality for more than 40 years. The above references are not a description of the historical course of the Modern Greek state however they are included in order to indicatethe obstacles and the environment within which the revolutionary worldview had to open up a new path. In this environment, the line of action of the Partywas steadily created, not always easily and not without occasional backstepping, in three known domains – economic, political, ideological,making gains , some smaller and some larger, as is shown by the reaction of the ruling class that almost from the very first moment mercilessly persecuted the communists. Under these conditions, and especially after the Party joined the Comintern in 1924, and with its gradual Bolshevization, it embarked on a heroic course with thousands of dead and victims of persecution of all kinds. Along with the daily economic struggle to survive, a persistent ideological battle was waged utilizing all forms, not only against bourgeois theories and the obscurantism of the church, but also against the open manifestation of fascism, as well as against the attempts at a revision of Marxism by the different opportunist currents of the period. The KKE, in its 100-year course has been and is a unique laboratory for popular education. Since the first years of its action, classic works of Marxism-Leninism have been translated and published. Marxist circles functioned. Even from the 1920’s, there were significant efforts made to disseminate the classic works in the form of separate pamphlets and in the magazine ‘Marxist Library’. In December 1944, while the battle of Athens was raging against the intervention of British imperialists and their local allies, representatives of the domestic bourgeois class, the Party School of the POA (Party Organization of Athens) did not interrupt its operation and its students went out and fought in battles after class was over. During the period of the civil war, in the mountains of liberated Greece, a broad educational cultural movement was created. The militants, both men and women of the Democratic Army, along with the art of war, learned how to read and write, attended theatrical performances and read literature. After the defeat, exile, and imprisonment they organized the “Stone Universities” under the guards’ noses where exiled and imprisoned men and women attended a broad program of lessons, adapted to their needs –writing, reading, including even mathematics, philosophy and foreign languages. Those who ended up as refugees in the USSR and the People’s Republics had, for the first time in their lives the chance to receive high-level education and specialization. The presence of a large section of Party forces in the socialist countries aided the intensification of translation and publishing work. Thus, by decision of the PB on December 28th, 1951, the first complete translation of ‘Capital’ and the ‘Selected Works of Marx and Engels, as well as the‘Collected Works’ of Lenin and Stalin were begun. At the same time, school books for all the educational levels were rewritten and published where children of political refugees were attending school. In the 1950s the intensive writing, translation, and publication of literary works began. The entirety of this production was directed in various ways in Greece, contributing to the support of the militants and the enlightenment of the people. In the period between the wars, but also after the Second World War, it would not be an exaggeration to state that the best representatives of the world of science and art were Party members or who cooperated with it. It is no coincidence that our country boasts five Lenin Prize awardees. However, heroic struggle and the intellectual achievements do not complete the picture. The system of contradictions in Greek society and the elaborations of the international communist movement led the KKE to accept, for many decades, the logic of stages in the revolutionary process; a logic, which in the name of delays in economic and political development was considered necessary in the countries of capitalism, the alliance of the working class with sections of the bourgeois class in order to further the development of the productive forces and the conquest and maintenance of bourgeois democratic rights as a necessary prerequisite for the maturing of the material preconditions for socialist revolution. As much as we understand the concern of our older comrades for a people that suffered from persecution, refugeeism, and poverty, today we cannot accept and implement such a policy. Consequently, the first conclusion we can draw from an evaluation of the developments and the sociopolitical processes in Greece is that in the era of monopoly capitalism the task of the party is to prepare the socialist revolution by determining the relative appropriate tactics. The second conclusion, resulting from the first, is that the general laws of social developments predominate over the specific. These laws are revealed in their fullest form in the classic works, especially in “Capital”. Whenever these laws were ignored or there was an attempt to ‘correct’ them, the result was always the same: defeat. This is evidenced by the incorrect estimation of the objective conditions in Greece during and at the end of the war, and consequently, the incorrect political line that our Party followed then, to not attempt to overthrow capitalist power. This bears witness, in the most painful way, to the overthrow of socialism in the USSR and the other People’s and Socialist Republics. The third conclusion concerns the relation of the Party itself with theory. Every theory, including revolutionary theory, remains the property of the bourgeois ruling class for the period in which that is not introduced broadly among the proletariat. This, not so elegant one could say, ascertainment was confirmed in the long past period during the rise of Nazism in Germany, but it is still confirmed today with the phenomena of manipulation of the spontaneous outbursts of indignation from strata of the population that have become impoverished under conditions of capitalist crisis. The Party is called upon to positively resolve the contradiction between theory and practice, by integrating the world theory with action into a single force capable of delivering mankind from the final historically exploitative system. Only in this way, can an intellectual break his self-imposed restriction to the office, by taking action and proving the theory in practice, and the proletariat acquires and develops his knowledge through the generalization of conclusions and his activity. The creation of the Party of a New Type that organizes and orientates the struggle of the working class for its own power. The introduction of the revolutionary worldview to the oppressed class and the smashing of the bourgeois monopoly on knowledge. The preparation of the vanguard, so that under conditions of a revolutionary situation it is in the position to complete the task of seizing power. The knowledge of the basic laws of socialist construction, in order to avoid mistakes that in the past led to the defeat of the global communist movement. For Greece especially, where the people are facing an eight-year protracted crisis of over-accumulation of capital, you know of the existence of a government which at its core is a social-democratic party – SYRIZA – that is trying to disguise its anti-people policies by invoking the left origins of many of its leaders. This party that emerged from the gradual social-democratic mutation of a group of leaders that split from the KKE in 1968 and in 1991, implements a harsh anti-people policy with unwavering consistency – the policy of memorandums, as it is called and has prevailed in Greece, whose only goal is the protection and the upgrading of the role of Greek monopoly capital in its struggle against the Greek people and its competition with the capital of other countries and imperialist centers. The usurpation and the defamation of the values and the justly earned moral superiority of the communists and other fighters on the left in Greece, which is attributed to SYRIZA by all our people, have nothing to do with the traditions and the ethos of the generations that measured up to and measure up to a people’s fighter,without regard to personal cost. Today our Party, self-critically evaluating its 100-year course and continuing its research into the causes of the overthrow of the socialist system, studies the laws of the expression and sharpening of the basic contradiction of capitalism at its monopoly stage, the intra-imperialist rivalries, that determine the political and military arena where the class struggle is waged in the contemporary world. Our duty, and this is firmly grounded in our theory, is to study, to enlighten the people of our country and to prepare them for the counter-attack on imperialist barbarism. Thus, the work of the classics, the revolutionary worldview is transformed from a “legitimate” “easily assimilated” academic object into a factor in the development of the sociopolitical processes in our country and internationally.